Pork chops are quickly becoming one of our favorite things to grill. A few weeks ago we grilled some delicious Bourbon Basted Pork Chops. I had some extra pork chops and decided to give another marinade a try. 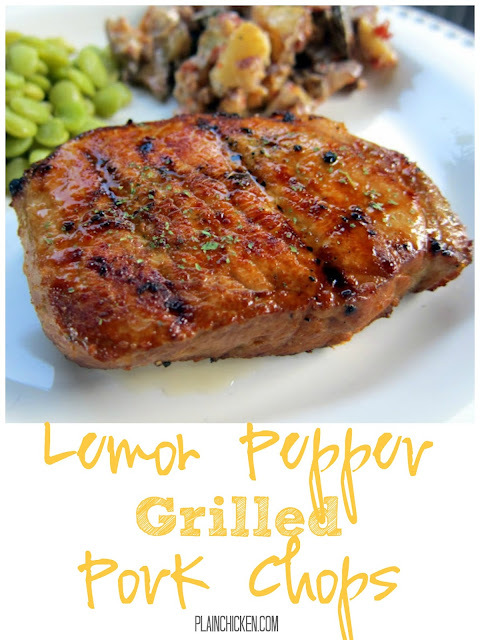 These lemon pepper pork chops were equally delicious and equally as easy to make! You need to let the chops marinate for a few hours. I always let the meat marinate overnight. I mix up the marinade and throw everything in the fridge before I go to bed at night. So much easier for when I get home from work. We served these pork chops with some Bacon Ranch Potato Salad - I substituted spicy ranch dressing for the original and it was great! Give it a try with these yummy pork chops. In deep bowl mix all marinade ingredients. Pour over pork chops and marinate at least 2 hours. Remove pork chops from marinade and grill 6 minutes on first side, flip and grill 5 more minutes. The marinade sounds very good and your crust looks perfect. I could go for one for breakfast this morning. I love how simple the recipe is. Will it also work on a George Forman grill? Marashea - it would be great on a George Forman grill. Hope you enjoy it! What a great sounding recipe. I like the idea of lemon pepper on grilled food. It would really add a nice flavor to pork. Thanks. This looks fab! I have a few pork chops hiding in the freezer...looks like they found their purpose! The pork chops look delicious but not those Lima beans. I will be giving them a try as I have extra pork chops in my freezer. I hope this will work on a grill pan cuz I don't have a grill. Looks so good! Yum! Have my pork chops in the marinade. Can't wait to grill these up tonight! Nice color on that chop. The marinade sounds good too. On a semi-unrelated note, the hayneedle advertisement on your blog showed my non-Egg smoker. I love lemon pepper on my grilled meats. I love the food service smallgoods delivery right across our house. They serve probably the greatest pork chops I have tasted, but this one looks as equally stunning as the menu I always order. I guess I'll have to give this a try. Thanks!